Vada's Blog Stamp Inks and Paper : 4 x 4 Notecard Holder. From the new CD, “Note card Holder and six cards with envelopes“. This was so much fun I’m working on another one and have hopes of making one extra just incase I should need a quick gift. 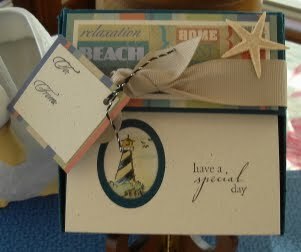 My papers are from K&Company the Sea Glass pack.Stamps are a mix and from the following companies;Hero Arts, Cornish Heritage Farms, Inkadinkado, and Fiskars.I also used my Spellbinder dies and colored pencils. I am always so impressed with your projects and these are no exception! Love these and what a great idea! These are great........I've been in the process of moving and won't have a chance to play until probably early next week. I have a lot of other obligations also. How do I get on your Christmas gift list? Love these!! This is wonderful! 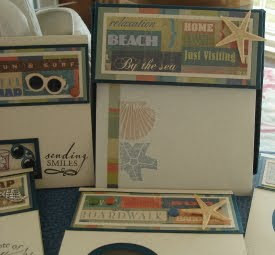 I love the paper you used--have a friend who'd love this! Awesome project. I always love what you do. These are awesome, Vada! Gorgeous design!